I found these four graphic novels about Jerusalem, Israel, and Jews struggling with their heritage particularly timely reading these past couple of months, particularly as we (as privileged Americans) were shocked and challenged by an explosive attack. It was eye-opening to think about living in a country where such a thing was a lot more possible. I enjoy learning from comics that convey alternative experiences, especially those that are so different from what I already know. What went wrong over there? And why aren’t there any answers without bias? Objective sources are very hard to find. Hundreds of pages later, I had alienated friends with my obsession… ignored important things in my life… and somehow knew less than when I started. I’m going to spoil a bit (since the book came out three years ago) — she doesn’t find the definite answers she’s looking for. However, her watercolor art makes for an enjoyable read that captures what feels like an authentic journey, and her learning to accept uncertainty makes for a more realistic growth experience. (The nine-panel grid also makes the book easy to read, for those not as familiar with the comic format.) It’s as though I’m traveling with her and her friend Melissa through the Golan Heights, to the Sea of Galilee, Tel Aviv, Masada, Jerusalem, and a night in a desert tent as an exploration of now-disappeared Bedouin culture. Some of the cultural pointers are obvious — discussion of security checkpoints or the ever-present threat of terrorism — while others are less so. The tour guide, for example, is a former soldier (as is everyone except the orthodox), and the bus group is accompanied by an armed guard (who’s also a medic). The 40 travelers are diverse, with some being Jewish converts, others more traditionally culturally religious. One sequence in How to Understand Israel in 60 Days or Less struck me, as Glidden stays awake with jet lag thinking about all the people who have lived on this land. She draws them each in bed, creating a commonality that transcends the historical disputes. 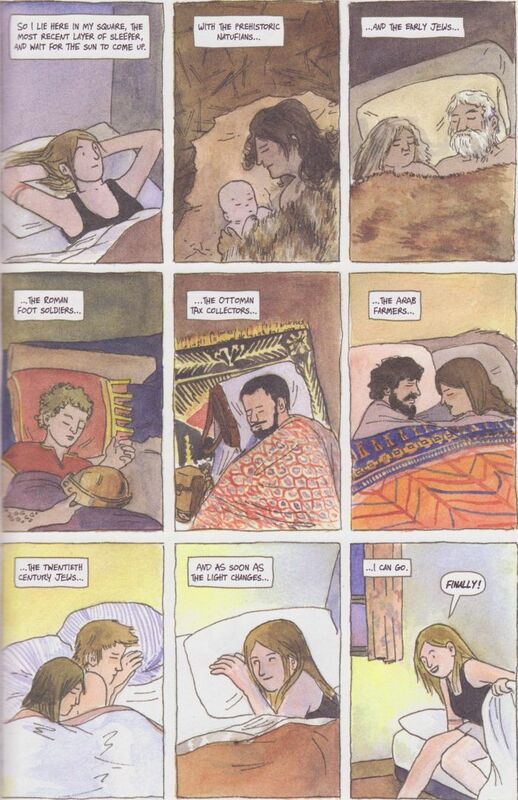 She also uses comics to allow herself to converse with figures from another time, as a way of visualizing the debates she’s struggling with over the Palestinian conflict and the pressure she feels to support one side or another. Amazingly, this is Glidden’s first graphic novel. It’s a good one, particularly for young adults who may identify with her love of travel and perspective as she is trying to find herself and her way in the world. 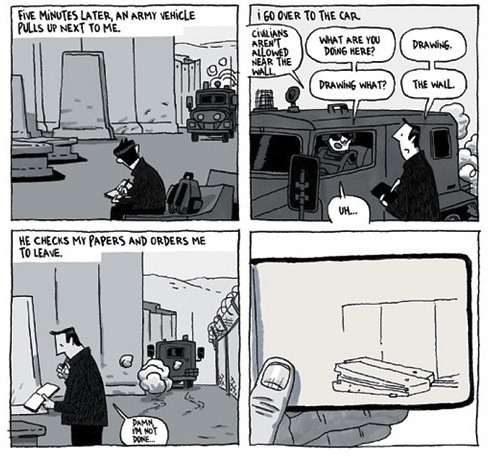 In contrast, this is far from Guy Delisle’s first travelogue. Previously, he’s shown us life in Shenzhen (China) and Pyongyang (North Korea). Those are countries we think we understand the bad things about, and his experiences there play to our assumptions. However, this book is more challenging, due to our mixed perspectives on Israel. Delisle and his family are spending a year in Jerusalem because his partner works for Médecins Sans Frontières, which we know as Doctors Without Borders. Their first struggle is understanding exactly where they are. Their apartment is in the east part of Jerusalem, previously an Arab village, so according to Israelis, they’re in their country, but by other versions, they’re in the West Bank, which should be part of Palestine. That confusion is only the first example of a duality that complicates the everyday events of caring for two small children in another country. In contrast to his previous books, Delisle is much more focused on the domestic in Jerusalem: Chronicles From the Holy City. Everything is complicated by having parallel systems. For example, whether you’re going to the Arab Quarters or not determines which kind of bus you take. The call to prayer for Muslims wakes their daughter just when she’s dropped off to sleep. Since they’re not particularly religious (at one point, Delisle declares his atheism), the way the city shuts down on Saturday surprises them. Much of his time is spent trying to negotiate getting the kids back and forth to school. There are more disturbing challenges, as well. The couple is separated when border crossings are closed due to security events for an unknown length of time. (His wife works in Gaza, the most restricted region, with only one crossing.) Delisle visits a security checkpoint with an observation group working for the end of Palestinian occupation, which turns into a battle of stones and tear gas grenades. Whenever he travels internationally, returning is an ordeal because of the particular areas in which his wife works. Time is spent in a region full of militant settlers and worrying how to get in to help an area under heavy bombing. Delisle’s panels don’t often use close-ups. They’re medium shots, to show us lots of the flavor of the surroundings. That approach also makes Delisle’s figures seem small and overwhelmed, sharing the complexity of living in the region. The color consists of monochrome tones of grey or taupe, creating an oppressive, unsettling mood, with the exception of full color for maps or historical moments. Yet in the midst of struggle, there are small moments of human bonding, whether attending an expat party or taking a day at the beach or simply meeting the neighbors at the local playground. If he’d spent more time there, he would have become more comfortable. By the second half of the book, he’s found a place to work and is beginning to settle into a routine. He draws himself having an art exhibition and discussing comics with students. Just as he begins to understand, it’s time to leave. The struggles Delisle goes through simply to live comfortably for a year may make the reader sympathetic to those being oppressed, not necessarily because of the politics, but just out of concern for those downtrodden by any bureaucracy. Jerusalem: Chronicles From the Holy City is a dense, lengthy, rewarding read that uses the personal to shed new light on the political. If you’re only going to read one of these books, make it this one. It’ll take some reading before all of that comes clear, though, as Katin wanders through sketches of life in the city, annoyed by bugs and music as she’s trying to work. She eventually takes two trips to Berlin, once to visit the son and girlfriend, and once when her work is put on display at the Jewish museum there. This is a very New York Jewish story. Those without connection to the region or religion may find it all a bit confusing, between the oddly paced storytelling and why a horrific event from 70 years ago should affect everyone’s decision-making today. Katin takes the undercurrent of “never forget … and keep holding a grudge” for granted among her readers, as though we all shared her perspective. Her mother (I’m assuming — several characters aren’t clearly identified), in contrast, is worried more about the girlfriend not being Jewish than she is with where the two will live. With the thick, creamy paper and Katin’s borderless style, reading this book feels like flipping through a sketchbook, particularly given the colored pencil images she’s created and the sometimes confusing selection of what she portrays. There are some lovely location images, although I found it unintendedly funny how Katin draws herself with big-eye glasses and a triangle for a nose. I was also put off by how crude some of the sequences are, as she gets grossly ill on the first visit and suffers from bedbugs on the second. Like Miriam Katin, the characters in The Property are still dealing with Holocaust ramifications. 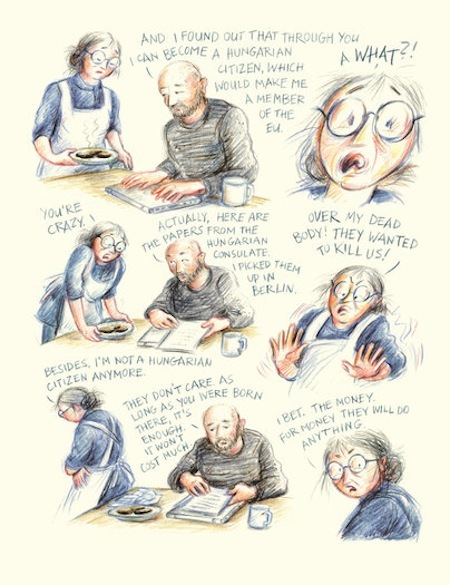 Mica and her stubborn grandmother are traveling from Israel to Warsaw, Poland, in order to find out what happened to the family’s property during the War. This story is fictional, though, which means everything ties together much more neatly than you’d expect in real life. Much like a grown-up Tintin, Modan’s story features strong, clear lines and a pervading sense of mystery. Relatives are dreaming of reclaiming property that would provide a financial windfall. A family friend, Avram, appears on the same trip, but it’s unclear what his motives are, although his pushiness quickly becomes annoying. The grandmother has mood swings and is keeping secrets from her descendent. The granddaughter meets a tour guide, who turns out to be a comic artist and becomes involved in the situation. Later, there’s a crazy historian who wants to recreate the ghetto but conveniently provides some key clues. One nice technique is how the trilingual aspects are handled — capitals are used for Hebrew, italics for Polish, and mixed-case for English. There’s also a sequence where the grandmother, in a cab to her old apartment home, sees how the city used to look, colored sepia through the window. It’s immediately clear what’s going on, an accomplished use of the comic language by Modan. As the two women struggle with their pasts and each other, I found myself engrossed, curious to find out what would happen. It’s a real page-turner, and the easy-to-read style makes it happen smoothly. I liked the sensation of hope throughout the story. No matter the affect of the secrets revealed, even if unsettling, there’s a feeling that things are improved because of the entire experience.